Once latched to the skin, there is only one best way to remove ticks. However, if they are not attached yet, there are a few ways to get rid of ticks. This is best if the tick has already bitten into the skin and is attached. Use tweezers and get as close to the skin as possible, pulling near the tick's head-never the body. Use a steady pressure and never twist or turn the tick in order to "unscrew" it from the skin. The goal is to get every bit of the tick. Leaving a piece of the mouth, for example, could be dangerous. If part of the tick is left behind once it has been removed, seek medical attention. Once the tick has been removed, you can kill it with alcohol and put it into a labeled container that has the date of removal. You may need it for identification purposes later. 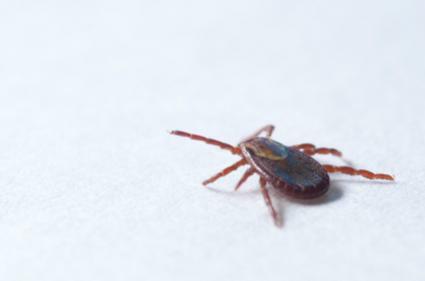 Never squeeze the body, use a lit match, or try to suffocate the tick with petroleum jelly as this can cause the tick to release toxic fluid back into the person or pet it is attached to. Wash the bite with soap and water, then apply antiseptic. Make sure to clean the tweezers as well. This seems like a no-brainer, but it's actually one of the best ways to remove ticks that haven't yet attached to the body but could still be crawling on the skin or in the hair. Keep in mind, however, that showering and washing your hair will have no effect on ticks that have already latched on. If you think you may have any ticks crawling on your clothing when you return home, putting all of them into the dryer for 20 minutes as soon as you get there will kill them. Do not apply Permethrin directly to the skin and use either product in small amounts. Be sure to read and follow the directions carefully. These products are more of a tick repellant than a removal method, but worth trying if you know you will be exposed to ticks. Other tricks to keeping ticks off of the skin include wearing light clothing, tucking pants into socks or boots, tucking your shirt into your pants, keeping hair pulled back, and checking your clothes and skin for ticks throughout the day.